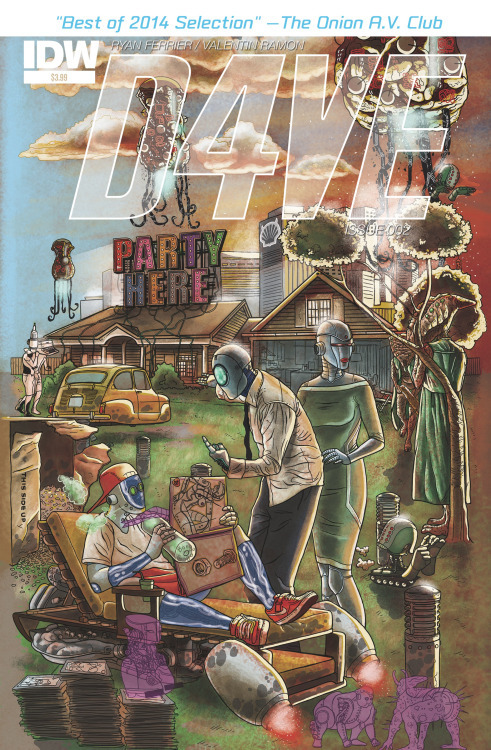 D4VE remains a personal, honest and funny take on humanity through the eyes of a hero robot but, this issue lacks the charm and narrative clarity that made the first one so good. As his personal life falls apart, D4VE prepares to save the outside world from falling apart, too. There’s aliens, guns, daydreams and awful robot sons. It’s a funny, light and still brutally honest issue that addresses relationships, heroism and more. The unfortunate thing is that the issue hinges on using the same narrative trick twice and by the second time, it feels tiresome and uninventive. D4VE is likeable enough and I want to root for him but maybe indulging his fantasies time and time again is a little bit TOO much, muddling the story and taking away from the effects of what’s going on. The art is, like the first issue, wonderful. It’s clear, crisp and vibrant. There’s details galore and the invading aliens are truly terrifying in the best ways. Where the narrative falters in this issue, the art carries it through. D4VE #2 isn’t as strong as the first one but it’s still a funny, likeable comic that has a real heart to it. If you haven’t read this before, you should be reading it now. If you have already read it, maybe it’s time to revisit D4VE’s world anyways.